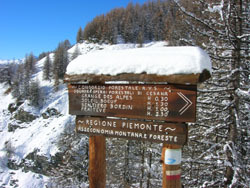 Adventures in Val Chisone and Around: Sestriere. 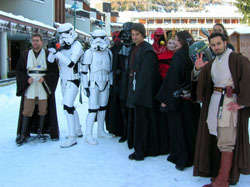 The Galactic Empire's No 1 ski resort! Sestriere. The Galactic Empire's No 1 ski resort! Sestriere is the coolest ski resort in the galaxy! This is official! 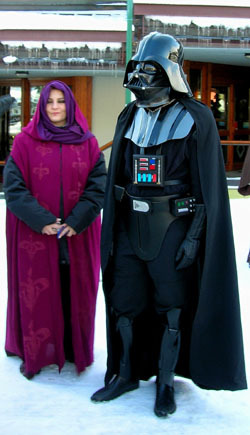 This weekend saw the “Galactic Empire” making a state visit to the resort. 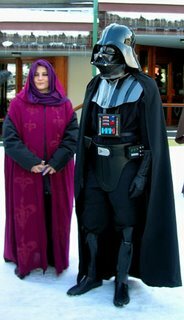 Darth Vader himself even made an appearance. Of all the places in the Galaxy he chooses Sestriere! How cool is that? 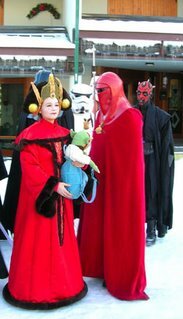 Not to be outdone Obi Wan and various other Jedi Lords were on hand to keep the Stormtroopers of the Dark Side in check. I was however a little disappointed not to see R2D2 or C3P0 around but perhaps they had not yet had their winter service? Also Friday brought the long awaited snow and was the first opportunity to get the snow shoes out this season. We took a walk around Monte Rotta at Sestriere. The views were fantastic and it was quite a relief to see that the Alps were comprehensively covered with a white blanket. They now look as they should do for this time of year and not like the Spanish plain. As I write there is more snow falling and more predicted over the weekend. Over the next few days I will be reporting on the conditions of our part of the Italian Alps. 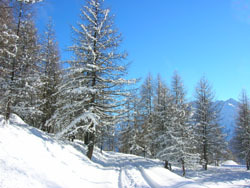 If you want to try an alternative to downhill skiing then check out our introduction to snowshoe and cross country skiing then check out our packages on our website.